This is an exclusive service offered by our team as a small cab rental services package. The offer has been designed for Kanpur trip takers, precisely for local city usages. You may easily avail this service any time you wish to. All you need to do is visit us through our online website and choose from a range of our services. The Local Full Day service will be available for a variety of local trips. Some of these include shopping, sightseeing, attending meetings, visiting hospitals, seminars, and a lot more. This is a specialized service designed for our clients. The small package service for local city tour usages will ensure 100% comfort and convenience for our travellers. We offer this service for half day car hire services. Some of these include Special Airport Transfer in Kanpur, Car rental service for Marriage, party and event, Corporate Cab Rental in Kanpur, Railway Transfer, visiting hospitals and a lot more. The service is one of the most useful for tourists who wish to avail adept pickups and drops facility from one destination to the other. We offer specialized pickup and drop facilities to our customers such as hotels pickups and drops, airport pickups and drops, railway station pickups and drops, and bus stand pickups and drops. At My Taxi India, we make double sure that our well trained chauffeurs reached the appointed destination in time. At My Taxi India, we guarantee premier quality special packages for outstation travel. These are known to be the ideal choice for all kinds of trips such as romantic getaways, adventure trip with friends, excursions, and family leisure trip. We ensure convenient services outside the city limits. Our consumers can rest assured about enjoying a stress free, pleasure filled trip around city of Kanpur. Our representatives will take special care of your interests and tour related requirements before arranging for a package. You can also expect special group packages from Kanpur to places nearby. The cars sent across will accommodate any group size to guarantee maximum convenience. This is an archetypal to and fro car hire service. The round trip hire service is highly useful for those who wish to make to and fro trip to the beautiful city of Kanpur. You may even avail this service for multiple destinations from Kanpur. This is a unique service designed for those who need one way drop to their specific destinations from Kanpur. This is a very beneficial package for you especially if you are planning to visit more than one city within a fixed period of time. 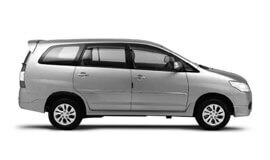 Apart from the above mentioned packages, we also offer special Kanpur city sightseeing tours and any other customized cab rental packages. We guarantee the best car rental services in Kanpur at highly affordable prices. Bon Voyage! Kanpur enjoys a tropical monsoon climate due to its location near to the Arabian Sea. For most of the year, the city experiences a humid climate. May is known to the hottest month of the year for Kanpur. The monsoon rains arrive in the month of June. Kanpur experiences a very short winter season. This exists between mid-December and February. Kanpur has a population of 2.551 million residents. Kanpur is revered as one of the biggest producers of leather production across the globe. These produces are exported in bulk. The major industries here are the leather and textile industries. Other significant ones include chemicals, fertilizer, two wheelers, pan masala, soaps, hosiery and engineering industries. The private sector is also ruling with the establishment of many large units such as the factories for JK Industries group, Duncans, Lohia machines, and many more. Kanpur is also widely popular for housing the largest tanneries in India. The city is home to one of the Software Technology Parks of India. Famous brand Ghadi Detergent powder and cake are also manufactured in Kanpur by Rohit Surfactanta Pvt. Ltd. Property is also one of the growing sectors of the Kanpur's economy. The beautiful historical city of Kanpur is nestled on the banks of the timeless River Ganga. Kanpur city stands as one of North India’s crucial industrial centres. It is widely revered for its historical, religious and commercial significance. It is believed that the city was founded by king Hindu Singh of the former state of Sachendi. Originally, the city was known as ‘Kanhpur’. There are many places of tourist interest in this city. Some of the most popular ones include Jajmau, Shri Radhakrishna Temple (J.K. Temple), Jain Glass Temple, Allen Forest Zoo, Kamla Retreat, Phool Bagh, Nana Rao Park, The Kanpur Memorial Church (All Soul’s Cathedral), Harcourt Butler Technological Institute, Indian Institute of Technology, Chandra Shekhar Azad University of Agriculture & Technology, Syed Badiuddin Zinda Shah Madar at Makanpur, Massacre Ghat, Green Park Stadium, Agricultural Gardens, Moti Jheel, Brijendra Swaroop Park, Dwarka Dhish Temple and many more.